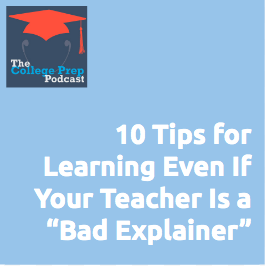 How do you get help in a class where you’re convinced your teacher is a “bad explainer”? Gretchen walks you through 10 practical tips for things to try first before giving up on getting answers from on your teacher. Know where you are on the Study Cycle before you get help from when you go to the teacher. Do you need retrieval practice or encoding practice? « 259: Is Getting Into the “Right College” Worth All the High School Stress?